Length 26ft 0in, Width 7ft 6in. Unladen Weight : 7 tons 7 cwts 0 qtrs. 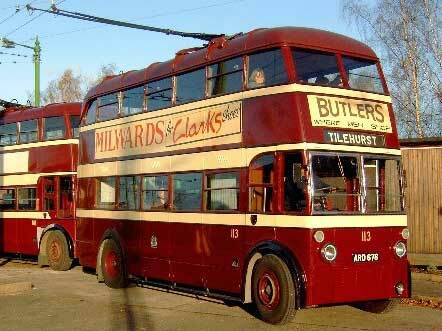 113 was one of a batch of 25 vehicles delivered to Reading Corporation Transport between December 1938 and April 1939. These vehicles had highbridge bodywork for which special dispensation had to be obtained from the Ministry of Transport because of the restricted space between the bus and the wires under the railway bridges in Oxford Road and Caversham Road. To keep the vehicles as low as possible the motors were fitted in a non-standard position to enable the floor line to be lowered. Following delivery these vehicles were stored at Mill Lane depot until 21 May 1939 when they entered service, replacing trams on the main line route between Pond House and London Road/Wokingham Road. They were used predominantly on the main line services between Tilehurst and Wokingham Road or Kentwood and Liverpool Road throughout their lives although they occasionally strayed onto the Whitley services. Like most vehicles in this batch, 113 received a number of modifications during its life. The lower rear end was redesigned in the mid 1940s which saw the registration plate consisting of raised numerals under a glass plate located just below the rear platform window removed and replaced by a hand-written plate lower down towards the offside, thus allowing space for an advert to be displayed. The front upper deck opening windows and some of those on the upper deck on both nearside and offside were replaced by plain glass on most vehicles in the early 1950s. The rear two-tier bumper originally fitted was removed in 1955 following complaints from crews that they sometimes received electric shocks when taking out the retriever pole. From new all these vehicles carried two small blue lights just beneath the front upper deck windows but these were removed in the mid 1950s. 113 was one of only 7 of these vehicles to remain in service throughout the period between 1939 and 1961 and was the last to be withdrawn in September 1961. It was purchased by the Reading Transport Society (now BTS), the first trolleybus to be preserved in private ownership and widely regarded as the vehicle that started the trolleybus preservation movement. Following purchase by the RTS 113 was kept in outside storage in Reading for 10 years the bodywork deteriorated badly. In 1971 No.113 was taken to Sandtoft and kept under cover until such time as she could be restored. That time finally arrived in 1998 and she was magnificently restored and finally entered service at Sandtoft in May 1999 and has operated there regularly ever since.